By bus take the E3 from "Turnham Green" Chiswick High Road to Edensor Road. Customers can buy directly from the producer and ask questions about the methods of production. Enables producers to obtain a fairer price for their goods by selling directly to the consumer. This gives them greater control and freedom over how food is produced. Because food is not being transported over great distances less damage is done to the environment. Food is sold fresh and produced for quality and flavour rather than to conform to size or quantity standards. Supports local British agriculture and keeps farmers in touch with consumers. A far greater variety of types of food are available and most importantly all tastes fabulous. 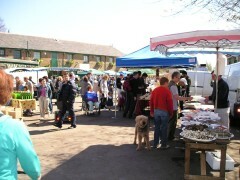 The Food Market Chiswick is held in the in the Farmyard to the rear of the Grove Park Farm House. The Food Market Chiswick is held in the farmyard setting of the Grove Park Farm House, adjacent to the Dukes Meadows recreational area, Chiswick House and Grounds and the River Thames in Chiswick London. Refreshments are provided by the local Bowls Club, for customers, walkers, runners, cyclists enjoying a day out by the river, come along and soak up the atmosphere. The Proceeds from the market is used by the Dukes Meadows Trust to help maintain the Childrens Water Play area and new Adventure Playground built on Dukes Meadows.